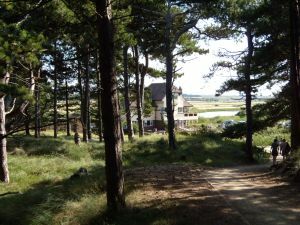 The Norfolk Wildlife Trust looks after about 50 nature reserves and protected sites. Here at Holme-next-the-Sea the NWT have the Holme Dunes nature reserve which was opened in 1965 and is designated NNR, SPA, SAC, SSSI and Ramsar. This 220 ha. coastal reserve is an important bird watching site and some 320 species have been seen in a variety of habitats including intertidal sands and mud, sand and shingle bars, saltmarsh, sand dune, freshwater and salty pools, grazing marshes and pines. 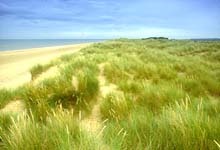 Holme Dunes is located just as The Wash meets the North Sea where the environment is rather fragile and occasionally under threat when an adverse combination of wind and tide attacks the dunes. The reserve is open year round from 10 a.m. until 5 p.m. Entry is free for NWT members and children and day permits are available for £3. The Visitor Centre is open daily 10 a.m. until 5 p.m. April to October and week-ends November to March. There are hides at the reserve and a four km nature trail with disabled access to one of the hides. Call 01485 525240 for further information.